Advent is not widely celebrated in England, its celebration actually originated in Germany, although in the church calendar Advent is the official start of the run up to Christmas. Two traditions that have caught on in England are the Advent calendar and the Advent candle. The Advent Calendar originated in the 19th Century from the protestant area of Germany. Protestant Christian families made a chalk line for every day in December until Christmas Eve. Before long, commercial entrepreneurs started replacing the ephemeral chalk lines with printed calendars. The first known Advent Calendar is for the advent of 1851. Nowadays it is usually a thin rectangular card with 24 or 25 doors. The doors are numbered 1-24/25. Door number 1 is opened on the 1st of December, door 2 on the 2nd etc. Behind each door there is a Christmas scene (but the most popular ones have a chocolate behind each door) . An Advent candle often has 25 marks on it, a bit of the candle is burned down by one mark each day. In some homes, 24 candles are kept, one for each night from December 1 through Christmas eve. One candle is lit for a while on December 1, then a new candle is added each day for the 24 day period. However, it is now more common to have four candles for the four weeks before Christmas. One candle is lit on the first Sunday, two the second week and so on. The candles were often placed on a wreath upon the dining room table. Advent candles are lit in many homes, schools and churches, in England, with a final central candle lit on Christmas Day; these are often on a hanging decoration known as an "Advent Crown." They became exceedingly popular due to a children's TV programme called Blue Peter, who every year made an advent crown from old coathangers, tinsel and candles! Well, they used to use candles, but because of health and safety insanity they now give instructions using baubles - it's not really the same, but you can make an advent crown following the instructions in this pdf file. In England less emphasis is placed on Christmas Eve than in other countries, much more is made of Christmas Day and Boxing Day. Carol singing, midnight church services and going out to the pub are some of the activities that many families enjoy (sometimes all three activities can be combined into one fun night out!). Night time on Christmas Eve though is a very exciting time for young children. It is the time when Santa or Father Christmas comes. They hang up their stockings and go to sleep. Santa and his elves make all the toys for Christmas in his home in Greenland. On Christmas Eve he piles all of the toys onto his sleigh and rides across the sky with his 9 reindeer (Dasher, Dancer, Prancer, Vixen, Comet, Cupid, Donner (or it may be Donder), Blitzen and of course ... Rudolf!). The most famous one is Rudolf the who is always the one at the front, to lead the way with his red nose. In the morning when the children wake up they open their stocking presents. Traditionally on Christmas Eve mince pies and sherry (or milk) are left out for Santa and nowadays carrots are left for his reindeer. Most children are in bed way before midnight waiting for Santa to visit. There are some interesting facts about Santa. 13 per cent of families always attend church on Christmas Day. Unfortunately all the excitement and stress means that at precisely 9.58 on Christmas morning the first rows begin, and the average parent ends up losing it, and they start to tell off their children for the first time around 11.07am. The strain of cooking the big Christmas dinner sees the average Brit start to sip their first alcoholic drink at 11.48am. 27 per cent of families sit down to watch the Queen’s Speech. Dinner is finally served at 3.24pm, with 85 per cent of people enjoying the traditional turkey with all the trimmings. All that food and drink means the first person falls asleep at around 4.58pm, with dad being the leader in losing the "staying awake" battle. Almost half of those who do nod off end up annoying the others with their loud snoring. For those who manage to stay awake, family board games are brought out at 5.46pm. 38 per cent of families think that spending time with the family is the best thing about Christmas Day. One Christmas ritual not drawn from an ancient tradition is the British monarch's broadcast on Christmas day. The tradition began in 1932 when King George V read a special speech written by Rudyard Kipling. The broadcast was an enormous success . It began, "I speak now from my home and from my heart, to you all...". Queen Elizabeth II continues the tradition to this day. Every year she broadcasts her message on Christmas Day, and it is heard by millions of people all over the world. In England most people watch or listen to it whilst digesting their Christmas Dinner! It originated in medieval times, when every priest was supposed to empty the alms box of his church and distribute gifts to the poor. Wealthy people indulged in huge Christmas feasts, and when they were finished, packed up the remains of feasts in boxes and gave them out to their servants. It didn't become widely celebrated though until Victorian England. In Ireland there is an Irish custom called "feeding the wren". The custom is based on a legend of St. Stephen. Once he was forced to hide in a bush, but a chattering wren gave him away. In the past Children caged the wren to help it do penance for this misdeed. Nowadays children carry a long pole with a holly bush at the top - which is supposed to hide a captured wren. In the UK Boxing Day is still a public holiday, some shops and supermarkets open nowadays, but banks and most offices remain closed. The sixteenth century saw England first officially celebrate the Twelve Days of Christmas. Shakespeare's Twelfth Night premiered in the first year of the seventeenth century, in a performance at the court of Elizabeth the First. Advent is usually solemn and religious in spirit, while Saint Steven's Day marks the beginning of the twelve days of Christmas, a light hearted time given over to merry making and fun. It is a holiday of heart-warming homecoming and family gatherings, with candles glowing in the windows as a sign of welcome. During the ancient 12-day Christmas celebration, it was considered unlucky to let the log in the fireplace stop burning. This log was called the Yule log and would be used to light the fire in New Year, to ensure that good luck carried on from year to year. The Yule Log custom was handed down from the Druids, but with the advent of gas and electric fires it is rarely observed nowadays. Another custom in medieval times, was to hide a dried bean in a cake, the cake was then eaten on Twelfth Night (January 6), during the most boisterous party of the year. The finder of the bean became "King of the Bean" and ruled the party for the night. Another eating myth is that for every mince pie you eat over the 12 days of Christmas you will have a month of good luck the following year! However, according to A Celebration and History(ISBN 0-679-74038-4), by Leigh Grant, the written lyrics to "The Twelve Days of Christmas" first appeared in Mirth without Mischief in the early 1780s in England. Grant states that the tune to which these words are sung apparently dates back much further and came from France. Mirth without Mischief describes "The Twelve Days of Christmas" as a type of memory game played by children at that time. A leader recited the first verse, the next child recited the second verse, and so on until someone missed a verse and had to pay some kind of penalty in the game. There was no religious significance. At anyrate the popular urban myth makes a good story... at least as good as the song itself, so here is a slice of urban myth culture for you: A very famous song about this time of year is "The Twelve Days of Christmas", which has a very interesting history. During the period 1558 to 1829 Catholics in England were prohibited from any practice of their faith by law - private or public. It was a crime to be a Catholic. Some people say that the song was written to help young Catholics learn the tenets of their faith during that period when to be caught with anything in 'writing' indicating adherence to the Catholic faith could not only get you imprisoned, but could also get you hanged, drawn and quartered! The song's gifts are allegedly hidden meanings to the teachings of the faith. "True Love" mentioned refers to God. "Me" refers to every baptized person, here are the other lyrics and their other hidden meanings. However, some people say this is an Urban Myth, but you can make your own mind up. If you want to know today's cost of this generous gift giving check out PNC Bank's web site. How would you feel to receive such lovely gifts? Read the replies that Sarah Truelove sent to her beloved. See here for New Year's Eve and New Year's Day. There are several "traditional" meals you can have at Christmas. Here's a brief look at what the British nosh on Christmas day. In the past some very strange things were eaten around Christmas. At lavish Christmas feasts in the Middle Ages, swans and peacocks were sometimes served "endored". The flesh was painted with saffron dissolved in melted butter and the birds were served wrapped in their own skin and feathers, which had been removed and set aside prior to roasting. Around Victorian times another traditional Christmas feast was roasted goose or roasted turkey. In Victorian times, most Londoners would have been familiar with the "goose club", which was a method of saving to buy a goose for Christmas. Goose clubs were popular with working-class Londoners, who paid a few pence a week towards the purchase of a Christmas goose. The week before Christmas, London meat markets were crammed with geese and turkeys, many imported from Germany and France, although some were raised in Norfolk, and taken to market in London. The birds were walked from Norfolk to the markets in London, to protect their feet the turkeys were dressed in boots made of sacking or leather and geese had their feet protected with a covering of tar. The traditional Christmas goose was featured in Charles Dickens' 'A Christmas Carol'. Nowadays, if you sit down with a typical British family on Christmas day, the starter is probably going to be prawns or smoked salmon. The main course is more than likely to be turkey, often free-range and the bigger the better, although goose has been making a bit of a comeback, and for the vegetarian in the family (there's always one) a nut roast, this is normally served with potatoes (roasted, boiled, mashed, or maybe all three), vegetables (including the devil's veg - brussel sprouts) roasted parsnips, and stuffing with gravy and bread sauce. This is usually followed by Christmas pudding; a rich fruit pudding served with brandy sauce or brandy butter. Christmas puddings or plum puddings are a very rich, dark pudding made with all sorts of dried fruits, nuts, spices, black treacle and lots of sherry or brandy. You can read more about Christmas puddings here. Christmas cakes are also very rich and dark and contain just about every dried fruit you can think of, nuts (usually blanched almonds) glace cherries, candied peel and once again, sweetened with black treacle. They are covered with a layer of marzipan or almond paste and then thick white "Royal" icing made with icing sugar and egg whites. It was introduced as a custom by the Victorians. Prior to that period, cake was eaten during Christmas, but without the toppings. The idea of using marzipan is thought to be linked to the Tudor Marchpane an iced and decorated cake of marzipan that acted as the table centrepiece during banquets and festive occasions. They should be made about six weeks before Christmas and are usually decorated with ribbons and images of Santa Claus or robins with holly. Mince pies were often known as Christmas pies, they were banned in the seventeenth century by that killjoy Cromwell but eventually came back into existence after the Restoration. They are made with mincemeat – which doesn’t contain meat at all (see my recipe). The sweet, rich and fruity pies that we are now accustomed to developed early in the twentieth century when the meat content was removed for good and now the "mincemeat" is a mixture of dried fruit (raisins, sultanas, candied peel, etc.,) apples, spices, sugar and suet, often moistened with brandy or sherry, and baked in small pastry cases. If the mincemeat is home made everyone in the household should stir it as it is considered to be lucky. The cases should be oval in shape, to represent the manger, with a tiny pastry baby Jesus on top, but as very few people have tins that shape they are nearly always round now. Here's my recipe for mincepies and mincemeat. Many Christmas traditions, including the Christmas card, originated in the UK. Yule logs, plum pudding, mince pies, fruitcakes, wassailing, the Christmas goose, mistletoe, holly and carol singing, are all firmly rooted in British soil. Christmas carols have their roots in medieval England, when minstrels traveled from castle to castle, today they would be called carollers. In addition poor people in England would go wassailing, they would bring their mugs to the door of rich houses hoping for a share of the wassail bowl. The drink in the bowl was called lambswool. It was a brew of hot ale with sugar, eggs, spices and roast apples floating in it. The book "A Christmas Carol" was written by Charles Dickens. It is the tale of a miser called Ebeneezer Scrooge who is visited by four ghosts (Jacob Marley, The Ghost of Christmas Past, The Ghost of Christmas Present and the Ghost of Christmas Future). He was made to see the error of his ways and became a reformed character. Today carollers generally collect money for charity. The 'Round Table' in England often sends a big sleigh with a Christmas tree and people singing and playing carols around the cities and towns of England. In Wales, each village may have several choirs which rehearse well in advance of the holidays and then go carolling collecting money for charity. The real St. Nicholas lived in Turkey, he was bishop of the Turkish town of Myra in the early 4th century. It was the Dutch who first made him into a Christmas gift-giver, and Dutch settlers brought him to America where his name eventually became the familiar Santa Claus. Long long ago, in the days when Saint Nicholas was alive, there lived a kindly nobleman. He had a beautiful wife and three pretty young daughters, and all the money his family would ever need. But one day, the mother of the family, who was a sweet gentle woman, became very ill. The nobleman was frantic! He summoned the town's only doctor, a very old, very wise woman, who knew all there was to know about herbs and magic. The old woman tried all the cures she knew, but she could do nothing to save the poor woman. Finally he called for the priest to come, but by that time his poor wife had passed away. The nobleman was in despair! He missed his wife so much that he lost his head. He wasted all his money away on silly projects and useless inventions. He became so poor that he had to move his family out of their castle and into a little peasant's cottage. Meanwhile his daughters were growing up. Poverty was difficult for them, but they remained cheerful and strong. They soon learned to do their own cooking, cleaning and sewing, and they took care of each other. All three girls were very pretty. In time each of them fell in love and wanted to get married. But they couldn't because their father was so poor. He had no dowry (a sum of money or some valuable property) to give to the prospective husband's family. He felt he had failed his own children, and he became even more sad and gloomy. Now, Saint Nicholas happened to live in the same area. The kindly saint had dedicated his whole life to doing good deeds, and was always on the lookout for someone in need. One night the saint came riding through the town on his white horse looking for the house of the nobleman and his three daughters. He rode up to the cottage and peeked in through a chink in the wall. That same night, the daughters had washed out their clothes by hand, and hung them up in front of the fireplace to dry. There were the stockings, three pairs, hanging right on the chimney. Inspiration struck Saint Nicholas. From his pouch he took out three little bags filled with gold coins. One by one he threw the bags down the chimney, so they landed in the stockings of the three daughters. The nobleman, worried about his daughters' futures, had terrible trouble falling asleep a night and was still awake. He heard the clip clop of the white horse as the saint was leaving, and peeked out of the door. He called out to Nicholas, but he had already disappeared into the dark night. When the daughters woke in the morning, they found their stockings filled with plenty of money for their dowries. When they went to tell their father, they found him sleeping peacefully with a smile on his face. Saint Nicholas had taken care of all his worries. And so, through the goodness of Saint Nicholas the three daughters were able to marry the men they loved, and the nobleman lived on to be a happy grandfather. St. Nicholas is a very hard-working saint, being the patron saint of children, merchants, apothecaries, pawnbrokers, scholars and mariners. He is reputed to be able to calm storms and rescue sailors. Even pirates have been known to claim his protection. Over the years he has become known as Santa Claus and even his now traditional red costume can be traced to Coca Cola advertising in America! The tradition of hanging up the stocking is still followed in the British Isles. It is left out on Christmas Eve, along with mince pies, sherry and carrots for Santa and his reindeer, and even today most children are in bed way before midnight waiting for Santa to visit. The stocking is opened by excited children on Christmas morning. Nowadays the gifts Santa Claus brings can be quite elaborate, in Victorian times it was traditionally fruit, nuts, sweets and coins. Christmas cards became popular in Victorian England, they were mostly home made and given to loved ones. 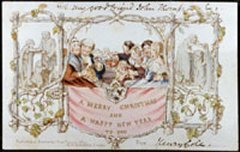 The first ever Christmas card was the brainchild of Sir Henry Cole, a leading cultural light in Victorian England who was later to become director of the Victoria and Albert Museum. The first commercial Christmas card (pictured above) had a hostile reception from some people because it depicted a family, children as well as adults, drinking wine. The card was painted by John Calcott Horsley. It depicts a family feast, under which appear the words, "A Merry Christmas and a Happy New Year to You". Side panels illustrated acts of Christmas charity - feeding and clothing the poor etc.. However it was Louis Prang, a 19th-century German immigrant to the United States, who popularised the sending of printed Christmas cards. Prang was a Bavarian-born lithographer who settled in Boston, Massachusetts in the 1850s and established a successful printing business. He invented a way of reproducing color oil paintings, the "chromolithograph technique", and created a card with the message "Merry Christmas" as a way of showing it off. He went on to produce a series of popular Christmas cards. By 1881 he was printing more than five million cards annually. The first charity Christmas card was produced by UNICEF in 1949. The picture chosen for the card was painted not by a professional artist but by a seven year old girl called Jitka Samkova of Rudolfo, a small town in what was then Czechoslovakia. The town received assistance from UNICEF after the Second World War, inspiring Jitka to paint some children dancing around a maypole. She said her picture represented "joy going round and round". Nowadays most people buy their cards from Hallmark etc., they are sent before Christmas Day and people use them to decorate their houses. It can be an expensive affair though, some families send and receive well over 100 cards. But what could be nicer than a mantle piece decorated with beautiful cards bearing good wishes from friends and relatives. Like many of our Christmas customs, gift giving has its historical origin in an ancient pre-Christian tradition. During the ancient Roman celebration of Saturnalia, the harvest festival, small candles and clay figures were given. At Calens, the Roman new-year, more elaborate gifts were exchanged. The Romans believed that sweet gifts would ensure a good year, so fruits, honey, and cakes were popular gifts. Evergreen branches, were given as symbols of continuous health and strength. Wealthy Romans gave each other gold coins for good luck. Everyone gave gifts, children gave to their teachers, slaves gave to their masters, and the people gave to their emperor. Even though the three kings and others gave presents to the baby Jesus, gift giving did not become an established part of the Christmas celebration until several centuries after the birth of Christ. Because the early Christians did not want their religion to be associated with pagan festivals, they shunned gift giving as a pagan practice. It was in the middle ages that gift giving began to be part of the Christmas tradition. The kings of England, like the emperors of Rome, demanded gifts from their subjects. The common people also exchanged gifts, but only among the wealthy were elaborate gifts given. The poor exchanged trinkets and entertained each other with songs and parties and plays. Nowadays, the knitted pattern jumper is considered to be the worst present you could find under the tree, followed by a dustpan and brush and the dreaded socks. Christmas Crackers have been a part of the traditional British Christmas since1847, when almost by accident, Tom Smith invented the cracker. They are used to decorate the table at dinner. In it's simple form a cracker is a small cardboard tube covered in a brightly coloured twist of paper. When the cracker is 'pulled' by two people, each holding one end of the twisted paper, the friction creates a small explosive 'pop' produced by a narrow strip of chemically impregnated paper. Inside the cracker there is usually a tissue paper hat, a balloon, a slip of paper with a very corny joke on it (for example: "What does Santa call his blind reindeer?" "No-eye-deer!" / "Where do fish wash?" "In the river basin!" / "What do you get if you cross a sheep with a kangaroo?" "A wooly jumper!" /" What lies in a pram and wobbles?" "A jelly baby!" ) and a small gift (usually a little cheap plastic thing e.g. a plastic ring or nail clippers). The family will pull each other's crackers before the meal starts, this often involves crossing arms and pulling two crackers at once. The person who gets the "big end" keeps the plastic trinket. The paper hats are donned, and the jokes read out, accompanied by moans and groans at how awful they are. Then, and only then, can the meal begin. Christmas trees are an integral part of the Christmas decorations in most British households. Although it was always traditional to bring evergreens into the house the Christmas tree is another tradition borrowed from Germany, where it is said that German Martin Luther was the first person to decorate a tree with candles and bring it indoors to show his children what stars looked like at night in the forest. It didn't become popular in Britain until the nineteenth century, when Queen Victoria’s husband Prince Albert introduced the custom from Germany. Nowadays in the UK you will find a variety of trees, from real trees with roots that can be replanted after the festivities, to felled trees that get recycled, to plastic imitations that get unpacked every year. No one seems to be able to agree which is the most environmentally friendly option. The tree will be decorated with lights (candles are a rarity due to the risk of fire), tinsel, baubles, chocolate figures and coins, and the obligatory angel / fairy on the top. There's a lovely joke about how the fairy ended up on the top of the Christmas tree here. Mistletoe was considered sacred by the people of ancient Britain. The Druid priests used it in their sacrifices to the gods.It was believed to have magical properties. People who met under a tree bearing mistletoe were forbidden to fight, even if they were enemies, and anyone who entered a home decorated with mistletoe was entitled to shelter and protection. Mistletoe may even have been part of Druidic wedding ceremonies. The Celtic people believed it had miraculous healing powers. In fact the name for mistletoe in the Celtic languages is all heal. mistletoe could cure diseases, render poisons harmless, make humans and animals fertile, protect the house from ghosts and bring good luck. In eighteenth century England mistletoe was credited, not with healing power, but with a different kind of magic. It was the magic element in the kissing ball, a special decoration used at Christmas parties. The kissing ball had a round frame that was trimmed with evergreens, ribbons and ornaments. Tiny nativity figures were placed inside it. For the finishing touch, a sprig of mistletoe was tied to the bottom of the ball. It was then hung from the ceiling, and party goers would play kissing games underneath it. A kiss under the mistletoe could mean deep romance or lasting friendship and good will. The mistletoe's kissing tradition, according to one account, comes from the Norse myths. Friga, one of the gods, gave her son, Balda, a charm of mistletoe to protect him from the elements, but because mistletoe grows neither from the water or the earth, nor from fire nor air, it grows on trees, it held the power to harm Balda. One of the other god's arrows made of mistletoe struck Bolda down, and his mother cried tears of white berries. She brought her son back to life, and vowed to kiss anyone who rested beneath the plant. Thus the kissing tradition began. There is a limit to how much you can kiss under one sprig of mistletoe though. For each kiss a berry must be removed and once all the berries are gone - no more kissing! Holly, with its dark green spiky leaves and red berries, was also believed to have magical powers and the ability to drive demons away. In Germany holly was considered to be a good luck charm against the hostile forces of nature. In old England, unmarried women were supposed to tie a sprig of holly to their beds, to guard them against ghosts and devils. the In medieval times, when people were genuinely afraid of ghosts and demons, supernatural creatures were believed to be especially active at Christmas time. For the Northern Europeans, Christmas came in the middle of winter, when the nights were very long, dark and cold. The voices of Ghosts and demons, witches, goblins and werewolves could be heard screaming out in the winter winds and storms. So the magical powers of mistletoe and holly were taken quite seriously. In Roman times ivy was the ancient symbol of Bakus, the god of wine and revelry. Due to its association with pagan festivals, for a long time, ivy was banned from the inside of Christian homes, and used only to decorate the outside. Not so any more. Its green has become part of the traditional Christmas. Along with a tree, and bits of tree, holly, ivy and misteltoe, a lot of other materials are used to decorate the house at Christmas. Some people don't even stop inside the house and the most amazing displays of lights and various inflatables decorate their front gardens. Wonder round urban areas of the UK you can spot the houses that have entered into the "competitive" spirit of seeing who can cram the most stuff into the smallest space. Inside the house you will typically find garlands, fake snow, nativity sets, candles, window decorations, and row upon row of Christmas cards. The table will be set (probably the only time in the year when the whole family sits down together to eat) with the best table cloth, glasses, crockery and cutlery. Pantomime or "panto" is traditionally performed at Christmas, with family audiences consisting mainly of children and parents. British pantomime is now a popular form of theatre, incorporating song, dance, buffoonery, slapstick, in-jokes, audience participation, and mild sexual innuendo. There are a number of traditional story-lines, and there is also a fairly well-defined set of performance conventions. Many theatres in cities and provincial towns throughout the United Kingdom continue to have an annual pantomime and it is very popular with Amateur Dramatics societies. 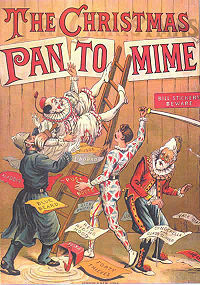 The Pantomime season lasts from around December to February. You should be able to see pantomime productions in many village halls and similar venues across the country. There are a few conventions, which can be a bit "surprising" if you're new to panto. * The leading male juvenile character (the "principal boy") is traditionally played by a young woman, usually in tight-fitting male garments (such as breeches) that make her female charms evident. * An older woman (the pantomime dame - often the hero's mother) is usually played by a man in drag. * Risqué double entendre, often wringing innuendo out of perfectly innocent phrases. This is, in theory, over the heads of the children in the audience, but titillating to the adults. * Audience participation, including calls of "look behind you!" (or "he's behind you! "), and "Oh, yes it is!" or "Oh, no it isn't!" The audience is always encouraged to "Boo" the villain, cheer the hero, and "Awwwww" any poor victims, such as the rejected dame, who usually fancies the prince. * Sing-a-long, usually a song that combes a well-known tune with re-written lyrics is sung. The audience is encouraged to sing the song; often one half of the audience is challenged to sing "their" chorus louder than the other half. * The animal, played by an actor in "animal skin" or animal costume. It is often a pantomime horse or cow, played by two actors in a single costume, one as the head and front legs, the other as the body and back legs. * The good fairy always enters from stage right and the evil villain enters from stage left. In the past the right side of the stage symbolized Heaven and the left side symbolized Hell. * The members of the cast throw sweets to the children in the audience (although nowadays this is often not done due to health and safety restrictions). * A slapstick comedy routine is often performed, often a decorating or baking scene, with humour based around throwing messy substances and custard pies in the face. A Nativity play is a play, usually performed at Christmas, which recounts the story of the Nativity (birth) of Jesus. Many primary schools and Sunday schools in the UK put on a Nativity play. Schoolchildren in costume act as the human and angel characters, and often as the animals and props. The infant Jesus is sometimes represented by a doll, but sometimes played by a real baby. Every year parents of young children dread the note from the school to say what role their child will play. Why do the dread it? Because they have to make the costume, and it's a very competitive thing. Parents are judged on the quality of the costume, children are judged on the role they get to play and how many lines they get to speak. If you're interested I got to play the star - not one line. In the UK, increasing secularism and sensitivity in multicultural areas has led many schools to end the performance of Nativity plays, or significantly alter their content, causing others to complain about excessive political correctness. In 2014, there were reports of drunken spacemen, Elvis Presley, footballers, aliens, punk fairies, and a lobster (that must be a posh school) all making an appearance. Another controversial topic is taking photographs or filming the play. Some schools have banned this because of fears of inappropriate use of the images. However, some canny schools then sell DVDs of the play. A nativity scene, or crèche, is a depiction of the birth of Jesus as described in the gospels of Matthew and Luke. Sometimes the scene is a static, three dimensional scene, but there are so called "living nativity scenes" in which real humans and animals participate. A typical nativity scene consists of figures representing the infant Jesus, his mother Mary, and Mary's husband, Joseph. Some nativity scenes include other characters from the Biblical story such as the shepherds, the Magi, and angels. The figures are usually displayed in a stable, cave, or other structure. Saint Francis of Assisi is credited with creating the first nativity scene in 1223 (a "living" one) intending thereby to cultivate the worship of Christ. The scene's popularity inspired communities throughout Christendom to stage similar pantomimes and eventually to create elaborate and ever more elaborate static exhibitions with wax, wooden and even ivory and precious metal figurines garbed in rich fabrics set against intricate landscapes. Chickens and turkeys contain a y-shaped bone known as the furcula (be careful how you pronounce that one), more commonly it is referred to as the wishbone. Traditionally this is removed from the carcass of the roasted bird, and dried out. It is then given to two people (usually children), who have to hook their little finger round an end each and pull it apart until it breaks, whilst making a wish. The person who gets the "bigger half" of the wishbone will have his or her wish "come true." Of course, in the great tradition of making wishes, you mustn't tell anyone what you wished for, or it won't come true. You can find Lynne's recipe for mincepies and mincemeat here. Don't worry if it doesn't snow in your country. Here you can build your own on-line snowman!